The Prince Pro Rebel 950 is the top model from the new Pro series by Prince. All rackets in this series have a low weight and offer unrivalled strength, response and control. 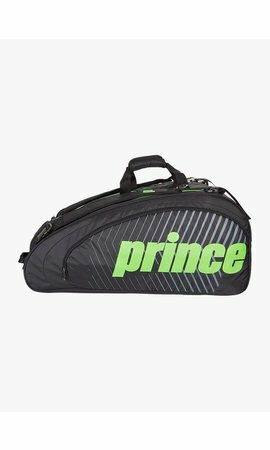 With a Power Level of 950, this is the most powerful Prince racket on the market. The highly streamlined frame with EXO3 technology ensures an overwhelming power at every shot. But this is not all: the Prince Pro Rebel 950 is the ultimate weapon also for shots that require a lot of ball feeling. This light racket of 135 grams requires a good technique from the player but offers a lot of control and ball speed in return. The extra-high balance point of 37,5 cm makes it possible to give a lot of speed to the ball despite the low weight of the frame. The racket has a head size of 464 cm2 and the medium-sized sweet spot (= the ideal place to hit the ball) provides a lot of feeling and optimal ball control. The closed string pattern of 16 x 16 guarantees even more precision. The racket features EXO3 technology which provides a larger sweet spot and extra power. There are large openings in different places in the frame so that the strings have more space to move. Even if you hit the ball close to the frame, you can easily give it a lot of speed and the right direction. The racket is equipped with the revolutionary PowerRing. In the neck of the frame the longitudinal strings are wrapped around an inverted ring, so that the strings can move even more freely. The resilience of the string bed is increased, resulting in unprecedented strength!